Harold Douglas Baines (born March 15, 1959) is an American former professional baseball right fielder who played in Major League Baseball for the Chicago White Sox, Texas Rangers, Oakland Athletics, Baltimore Orioles and Cleveland Indians between 1980 and 2001. Baines batted and threw left-handed. He is best known for his three stints with the Chicago White Sox, a team he coached with until 2015, before moving into a role of team ambassador and spring training instructor. Baines, a Maryland native, played seven years with his hometown team, the Orioles, over three separate stints. Upon his retirement, Baines ranked seventh in American League (AL) history in games played (2,830) and tenth in runs batted in (RBIs; 1,628). Noted as well for his power hitting in clutch situations, he is tied for seventh in AL history in grand slams (13), fourth in three home run games (3), and tied for seventh in major league history in walk-off home runs (10). Baines batted over .300 eight times and hit .324 in 31 career postseason games, topping the .350 mark in five separate series. A six-time All-Star, Baines led the AL in slugging percentage in 1984. He held the White Sox team record for career home runs from 1987 until Carlton Fisk passed him in 1990; his eventual total of 221 remains the club record for left-handed hitters, as do his 981 RBIs and 585 extra base hits with the team. His 1,652 games as a designated hitter are a major league record, and he held the mark for career home runs as a DH (236) until Edgar Martínez passed him in 2004. He also led the major leagues in hits as a DH (1,688) until the mark was surpassed by David Ortiz on July 10, 2013. He was elected to the Baseball Hall of Fame on December 9, 2018, by the Today's Game Era Committee. Baines was born in Easton, Maryland. He graduated in 1977 from St. Michaels High School on Maryland's Eastern Shore where, as a senior, he batted .532 and was named a high school All-American. The White Sox made Baines the first overall selection in the 1977 amateur draft. He received a signing bonus of $32,000 - a record low for a first overall pick. The owner of the White Sox at the time, Bill Veeck, had spotted Baines playing Little League ball years before at the age of 12. On Opening Day 1980, Baines made his MLB debut, starting as an outfielder with the Chicago White Sox. On 1982, he had 165 hits, 25 home runs and 105 runs batted in (RBIs). In 1984, baseball writer Bill James called Baines his favorite opposing player to watch, saying, "He is gorgeous, absolutely complete. I've seen him drop down bunts that would melt in your mouth, come up the next time and execute a hit and run that comes straight off the chalkboard. I've seen him hit fastballs out of the yard on a line, and I've seen him get under a high curve and loft it just over the fence." Baines ended the longest game in major league history (eight hours and six minutes over 25 innings on successive evenings) with a walk-off home run against the Milwaukee Brewers' Chuck Porter on May 8, 1984; the bat he used is currently kept at the Baseball Hall of Fame. In 1986, a succession of knee problems began which gradually ended his fielding career, forcing him to become a regular designated hitter. Despite the knee ailments and the resulting lack of speed, he remained a powerful hitter, picking up 166 hits in 1988. Baines holds the record for the most seasons by a player between 100 RBIs, with 14 seasons between 113 RBIs for Chicago in 1985 and 103 for Baltimore and Cleveland in 1999. Baines's number 3 was retired by the Chicago White Sox in 1989. Midway through the 1989 season, the Texas Rangers acquired Baines, along with Fred Manrique, from the White Sox in a much-derided trade which sent Wilson Álvarez, Scott Fletcher and Sammy Sosa to Chicago. After the trade, the White Sox retired Baines' #3 on August 20, 1989, a rare occurrence for a player who was still active in the major leagues (the number would be "un-retired" each time Baines returned to the White Sox, and he wore it as a coach). In 1990 Baines was traded to the Oakland Athletics for minor league pitchers Scott Chiamparino and Joe Bitker, and he helped them reach the postseason only to be swept by the Cincinnati Reds in the World Series. In 1992 the Athletics returned to the playoffs, only to lose to the Toronto Blue Jays in the ALCS. Prior to the 1993 season, Baines was traded by the A's to the Baltimore Orioles for minor league pitchers Bobby Chouinard and Allen Plaster. Baines batted .313, .294 and .299 over his first three seasons with Baltimore. He returned to the White Sox as a free agent in 1996 but was traded back to Baltimore midway through the 1997 season; he helped the Orioles reach the playoffs, losing to the Cleveland Indians in the League Championship Series. Baines represented the Orioles in the 1999 All Star Game before being traded to the Cleveland Indians later that year. Baines was signed again for a third stint with his hometown team prior to the 2000 season. Baines was traded by Baltimore with catcher Charles Johnson to Chicago in exchange for Miguel Felix, Juan Figueroa, Brook Fordyce and Jason Lakman on July 29, 2000. His final contract with the White Sox was not renewed following the 2001 season, after his third stint with the team. He finished his career with 2,866 hits, 384 home runs and 1,628 RBIs. His career RBI total is 30th all-time; prior to his induction, he had the ninth highest RBI count among retired players not elected in the Hall of Fame; his hit total ranks 41st all-time. Baines took a high step with his right leg, a la Mel Ott, as part of his stride into a pitch. Baines' fourth stint with the Chicago White Sox began when he was named bench coach in March 2004 under new manager Ozzie Guillén, his White Sox teammate, from 1985 to 1989 and in 1996–97. In 2005, as a coach for the White Sox, he earned a World Series ring when the White Sox won the 2005 World Series. On July 20, 2008, the White Sox unveiled a bronze statue of Baines at U.S. Cellular Field prior to their game against the Kansas City Royals; it is the seventh statue featured on the park's outfield concourse. In August 2009 the Orioles announced that Baines would be inducted into the Orioles Hall of Fame as the 46th member. In his seven seasons with the Orioles he batted .301, had 107 home runs, and 378 RBIs as their designated hitter. Baines had been eligible for the National Baseball Hall of Fame beginning with the 2007 election. While 75% of the vote is needed for induction, he never received greater than 6.1% (which he received in 2010). On January 5, 2011, Baines received just 28 votes (4.8%) in the 2011 Hall of Fame election, dropping him off all future writers' Hall of Fame ballots by receiving less than 5.0% of the vote. On December 9, 2018, Baines and Lee Smith were elected to the National Baseball Hall of Fame Class of 2019 via the Today's Game Era ballot, a voting panel of 16 consisting of six players (five played against him), one manager, six executives, and three journalists. Although many baseball writers and fans were shocked that someone who was eliminated so quickly from the regular ballot with such a low percentage history was allowed in through the Veterans Committee, Baines was voted in by his peers on the committee, as he played against five of the six players on the committee, while a sixth was a manager against him, and four executives who served on the panel were in management while Baines was a player, while also his former manager and team owner also were on the committee at the time. Baines' hometown of St. Michaels has designated January 9 as Harold Baines Day. He has also created the Harold Baines Scholarship Fund to help deserving college-bound students. Baines is married to Marla Henry and has four children: Toni, Britni, Harold, Jr., and Courtney. Harold, Jr. went to McDaniel College which is NCAA Division III in athletics and formerly known as Western Maryland College, located in Westminster, Maryland. All attended Baines' alma mater, St. Michaels Middle/High School. ^ "White Sox will keep manager Robin Ventura for 2016 season". Chicago Tribune. November 2, 2018. Retrieved December 10, 2018. ^ "Signing Bonuses: No. 1 Overall Picks Year-by-Year". Perfect Game USA. Retrieved January 18, 2018. ^ James, Bill (1984). "Player Ratings". The Bill James Baseball Abstract 1984. New York: Ballantine Books. p. 220. ISBN 0-345-31155-8. ^ Spatz, Lyle (2007). TheSABR Baseball List & Record Book – Baseball's Most Fascinating Records and Unusual Statistics. United States: Simon & Schuster. p. 496. ISBN 9781416532453. ^ "Teary Baines gets statue, 21 July 2008, Toni Ginnetti, Chicago Sun-Times; accessed 15 August 2008". Archived from the original on August 9, 2008. Retrieved August 16, 2008. ^ "Baines grateful and honored by his statue, 20 July 2008, Dave van Dyck, Chicago Tribune; accessed 15 August 2008". Archived from the original on August 4, 2008. Retrieved August 16, 2008. ^ MLB.com (March 24, 2009). "Harold Baines elected to Orioles Hall of Fame". Baltimore.orioles.mlb.com. Retrieved December 10, 2018. ^ "Cubs pitcher Lee Smith, White Sox outfielder Harold Baines elected to the Hall of Fame". Chicago Tribune. November 2, 2018. Retrieved December 10, 2018. 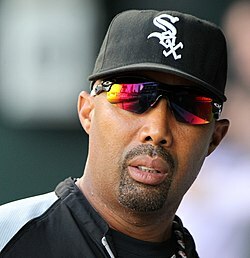 ^ "Harold Baines Speaks". Z.lee28.tripod.com. Retrieved December 10, 2018. ^ "Manager and Coaches | WhiteSox.com: Team". Chicago.whitesox.mlb.com. Retrieved December 10, 2018.